And as I stood I felt a small hand creep into my right one, as if a child had come up beside me in the dimness and taken hold of it. It felt cool and its fingers curled themselves trustingly into my palm and rested there, and the small thumb and forefinger tucked my thumb between them. As a reflex, I bent it over and we stood for a time which was out of time, my own man's hand and the very small hand held as closely together as the hand of a father and his child. But I am not a father and the small child was invisible. I have developed a mild obsession with Susan Hill over the last week and I have found myself searching out her books, especially after realising that she wrote children's books too and that one of my girls was reading one. I had read a lot of reviews of her book 'The Woman In Black' and found myself mildly curious about her work. So I thought I would start with this book as it fits nicely into the November Novella Challenge. OK, 167 pages may seem a little too big for a novella, but this book is a lot smaller in size than a normal book, so I definitely think it would count. Adam Snow is an antiquarian bookseller, who takes a wrong turning in his car one day after visiting a client and finds himself standing outside a derelict Edwardian house. Curiosity gets the better of him and he ventures into the grounds to look around. Whilst taking in the scenery, he feels a child's hand take his, but he soon realises that the child cannot be seen. He becomes obsessed with the house and the child until the child takes a sinister turn to his visits. What I found that I loved about Susan Hill's prose was her attention to detail. Her writing is full of description, allowing you to fully experience the situation she is writing about. I cannot tell you how much it has helped me during my first week of NaNoWriMo and I found myself really looking up in awe at her talent and wanting to write in the same manner as her. This book is a ghost story, but not a scary one. It is very atmospheric and the ghost is completely believable, but I did not resort to leaving the hall light on after I went to bed. I wonder if that may have been more because I found myself studying the way she wrote rather than absorbing the content of her story. Even though, this book is quite short, the characters come to life quite quickly and your involvement with the story occurs at once, leaving you spellbound by the end of the first chapter. The book appeared to be quite timeless to me, and I found myself shocked when they mentioned emails as I had convinced myself that the book had been set in the 50's or 60's. This book has all the makings of a good ghost story: atmosphere, a haunted house, a Gothic feel and a ghost with a purpose and a sinister twist. I thoroughly enjoyed this book and look forward to reading more of Susan Hill's work. This sounds right up my alley. I have never heard of Susan Hill. Thanks for bringing it to my attention! I've heard a lot about Susan Hill lately. I really want to give her a try, but it seems like she'd be good for me to save until RIP season next year. 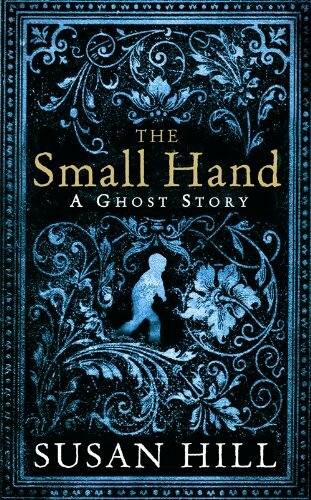 I do like Susan Hill's ghost stories and can't wait for this to hit the shelves of our library. This does sound intriguing, Vivienne. I will keep an eye out for work by Susan Hill. It's interesting how reading influences your own writing, isn't it? wow, this sounds great. that first line in the blurb is creepy. Sounds like a good ghost story. Oooh, this sounds positively wonderful!!! I just read a book (The Vanishing of Katharina Linden) that had that same sort of jarring affect--I kept thinking it was set in the past and then there would be some modern reference that would knock me back into the present. I really loved it for that. This sounds wonderful. I thought Woman in Black was great because of the atmosphere she created. Sounds like this is just like that. I'll have to put it on my radar. Hope your NaNo writing is going great! This one sounds so good! For the life of me, I can't remember which Susan Hill book that I've read. But I do remember enjoying it very much. This sounds similar to The Woman in Black - wonderfully atmospheric if not exactly scary. I'll keep an eye out for it for sure. Wow, this one sounds really, really good. I need to read this. I'd also recommend another novella by her, The Man In The Picture. Oops! The Man in the Painting. Sorry I'm such a nut. I should never type or think before coffee. Susan Hill's book is called The Man in the Picture. Arrgh!